Chapter VIII Of Equilibrium, and of the General and Particular Method of Preparation of the Furniture of the Temple and of the Instruments of Art. As said above, the object of any magick ceremony is to unite the Macrocosm and the Microcosm. In this way let every idea go forth as a triangle on the base of two opposites, making an apex transcending their contradiction in a higher harmony. It is not safe to use any thought in Magick, unless that thought has been thus equilibrated and destroyed. Thus again with the instruments themselves; the Wand must be ready to change into a Serpent, the Pantacle into the whirling Svastika or Disk of Jove, as if to fulfil the functions of the Sword. The Cross is both the death of the “Saviour”8) and the Phallic symbol of Resurrection. Will itself must be ready to culminate in the surrender of that Will:9) the aspiration's arrow that is shot against the Holy Dove must transmute itself into the wondering Virgin that receives in her womb the quickening of that same Spirit of God. “The Book of Lies falsely so called” (Liber 333) is worthy of close and careful study in this respect. The reader should also consult Konx Om Pax, “Introduction”, and “Thien Tao” in the same volume. All this is to be expressed in the words of the ritual itself, and symbolised in every act performed. They start on it at a great pace, and then find that their boots are covered with mud. Instead of persisting, they go back to Piccadilly. Such persons have only themselves to thank if the very street-boys mock at them. Another recommendation was this: buy whatever may be necessary without haggling! On the other hand, if you purchase without haggling you will find that along with your purchase the vendor has thrown in the purse of Fortunatus. No matter in what extremity you may seem to be, at the last moment your difficulties will be solved. For there is no power either of the firmament of the ether, or of the earth or under the earth, on dry land or in the water, of whirling air or of rushing fire, or any spell or scourge of God which is not obedient to the necessity of the Magician! That which he has, he has not; but that which he is, he is; and that which he will be, he will be. And neither God nor Man, nor all the malice of Choronzon, can either check him, or cause him to waver for one instant upon the Path. This command and this promise have been given by all the Magi without exception. And where this command has been obeyed, this promise has been most certainly fulfilled. In all actions the same formulae are applicable. To invoke a god, i.e. to raise yourself to that godhead, the process is threefold, PURIFICATION, CONSECRATION and INITIATION. Therefore every magical weapon, and even the furniture of the Temple, must be passed through this threefold regimen. The details only vary on inessential points. E.G. to prepare the magician, he purifies himself by maintaining his chastity17). The oath which he takes is replaced by a “charge” in similar terms. The details of the preparation of each weapon should be thought out carefully by the magician. Further, the attitude of the magician to his weapons should be that of the God to the suppliant who invokes Him. It should be the love of the father for his child, the tenderness and care of the bridegroom for his bride, and that peculiar feeling which the creator of every work of art feels for his masterpiece. Where this is clearly understood, the magician will find no difficulty in observing the proper ritual, not only in the actual ceremonial consecration of each weapon, but in the actual preparation, a process which should adumbrate this ceremony; e.g., the magician will cut the wand from the tree, will strip it of leaves and twigs, will remove the bark. He will trim the ends nearly, and smooth down the knots: — this is the banishing. He will then rub it with the consecrated oil until it becomes smooth and glistening and golden. He will then wrap it in silk of the appropriate colour: — this is the Consecration. He will then take it, and imagine that it is that hollow tube in which Prometheus brought down fire from heaven, formulating to himself the passing of the Holy Influence through it. In this and other ways he will perform the initiation; and, this being accomplished, he will repeat the whole process in an elaborate ceremony. I have omitted to say that the whole subject of Magick is an example of Mythopoeia in that particular form called Disease of Language. Thoth, God of Magick, was merely a man who invented writing, as his monuments declare clearly enough. “Grammarye”, Magick, is only the Greek “Gramma”. So also the old name of a Magical Ritual, “Grimoire”, is merely a Grammar. It appeared marvellous to the vulgar that men should be able to communicate at a distance, and they began to attribute other powers, merely invented, to the people who were able to write. The Wand is then nothing but the pen; the Cup, the Inkpot; the Dagger, the knife for sharpening the pen; and the disk (Pantacle) is either the papyrus roll itself; or the weight which kept it in position, or the sandbox for soaking up the ink. And, of course, the Papyrus of Ani is only the Latin for toilet-paper. To take an entirely different case, that of the Circle; the magician will synthesize the Vermilion required from Mercury an Sulphur which he has himself sublimated. This pure vermilion he will himself mix with the consecrated oil, and as he uses this paint he will think intently and with devotion of the symbols which he draws. This circle may then be initiated by a circumambulation, during which the magician invokes the names of God that are on it. Any person without sufficient ingenuity to devise proper methods of preparation for the other articles required is unlikely to make much of a magician; and we shall only waste space if we deal in detail with the preparation of each instrument. 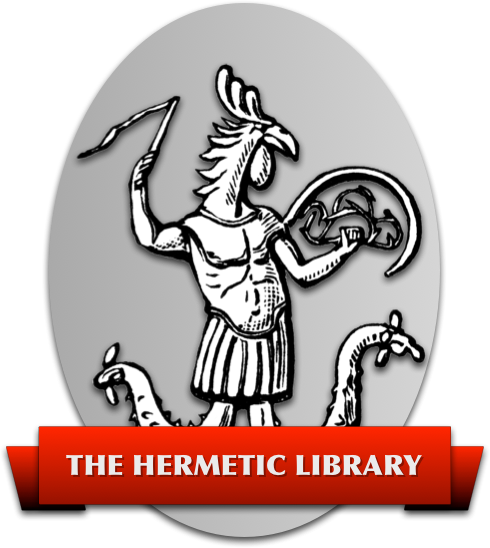 There is a definite instruction in Liber A vel Armorum, in the Equinox, Volume I, Number IV, as to the Lamp and the Four Elemental Weapons. The full significance of this aphorism is an Arcanum of the grade of Ipsissimus. It may, however, be partially apprehended by study of Liber Aleph, and the Book of the Law and the Commentaries thereon. It explains Existence. This is the case because we happen ourselves to be Microcosms whose Law is “love under will”. But it is also Magick for an unit which has attained Perfection (in absolute nothingness, 0 Degree), to become “divided for love's sake, for the chance of union”. This is because the essence of his being a Magician is his intuitive apprehension of the fundamental principles of the Universe. His instinct is a subconscious assertion of the structural identity of the Macrocosm and the Microcosm. Equilibrium is the condition of manifested existence. See Bagh-i-Muattar, V, par. 2. The Ring has not been described in Part II of this book, for reasons which may be or may not be apparent to the reader. It is the symbol of Nuit, the totality of the possible ways in which he may represent himself and fulfill himself. For example, as when Firmness with one's self or another is the truest kindness; or when amputation saves life. See Liber 418, 11th Aethyr. It is the extension in matter of the Individual Self, the Indivisible Point determined by reference to the Four Quarters. This is the formula which enables it to express its Secret Self; its dew falling upon the Rose is developed into an Eidolon of Itself, in due season. See Liber LXV and Liber VII. See The Qabalah for the use of this word, and study the doctrine concerning the Kings of Edom. See Poincare for the mathematical proof of this thesis. But Spiritual Experience goes yet deeper, and destroys the Canon of the Law of Contradiction. There is an immense amount of work by the Master Therion on this subject; it pertains especially to His grade of 9 Degree = 2Square. Such profundities are unsuited to the Student, and may unsettle him seriously. It will be best for him to consider (provisionally) Truth in the sense in which it is taken by Physical Science. It is, and the fact is still more important, utterly fatal and demoralizing to acquire the habit of reliance on others. The Magician must know every detail of his work, and be able and willing to roll up his shirtsleeves and do it, no matter how trivial or menial it may seem. Abramelin (it is true) forbids the Aspirant to perform any tasks of an humiliating type; but he will never be able to command perfect service unless he has experience of such necessary work, mastered during his early training. In this sense especially: any one thing involves, and is involved in, others apparently altogether alien. “For enduring unto the End, at the End was Naught to endure.” Liber 333, Cap Zeta. However closely the square of any fraction approximates to 2, no fraction equals the square root of 2. The square root of 2 is not in the series; it is a different kind of number altogether. Observe well that there is never any real equivalence or measurable relation between any two things, for each is impregnably Itself. The exchange of property is not a mathematically accurate equation. The Want is merely a conventional expression of the Will, just as a word is of a thought. It can never be anything else; thus, though the process of making it, whether it involves time, money, or labour, is a spiritual and moral synthesis, it is not measurable in terms of its elements. See The Book of the Law and the Commentaries thereon for the true definition of this virtue. and abstaining from any defilement. But to do the same with, let us say, the Cup, we assure ourselves that the metal has never been employed for any other purpose — we smelt virgin ore, and we take all possible pains in refining the metal — it must be chemically pure. To sum up this whole matter in a phrase, every article employed is treated as if it were a candidate for initiation; but in those parts of the ritual in which the candidate is blindfolded, we wrap the weapon in a black cloth((This refers to the “formula of the Neophyte”. There are alternatives.